Ein hübsches altes bonairäisches Fischerhaus, das gerade renoviert wurde und an einem der besten Orte von Bonaire liegt: dem Boulevard in Kralendijk. Tolle Aussicht auf das Meer und die festgemachten Schiffe. Schwimmen, schnorcheln und tauchen vor Ihrem Ferienhaus! Setzen Sie sich auf die Veranda und genießen Sie den Sonnenuntergang, während Fischer am Strand direkt vor Ihren Augen ihren frisch gefangenen Fisch reinigen. Dieses Haus am Meer (in 2 Hütten aufgeteilt) befindet sich in einzigartiger Lage am Boulevard - Playa Lechi. Ausstattung: Mieten Sie ein Boot und halten Sie es vor dem Haus. Tauchen Sie von zu Hause aus und machen Sie einen Tauchkurs nebenan. Spazieren Sie zu allen Restaurants, Bars, Geschäften usw. In der Nähe der Stadt, aber weit genug entfernt, um eine ruhige Zeit zu verbringen. Mieten Sie Ihre Ausrüstung gleich nebenan oder nehmen Sie an Ihrem Tauchkurs teil. This is a nice property and in a wonderful location, but the description could mislead some vacationers. As mentioned in the description, this is two small cottages together on one lot. Each cottage is a small one bed/one bath, each having an additional three twins or sofa beds. Only the main bedroom in each cottage is air conditioned. This property would work well for two couples, or perhaps two couples each having one child, but it is not really a three bedroom. When I rented this, the plan was for three adults to share the house, each adult having one bedroom. Fortunately, one of the adults dropped out of the trip, so it was only two of us, and it worked fine. But had the third party come along, it would have been miserable. No way does this property sleep seven, unless you really don't care at all about privacy or sleeping with a/c. The mattresses were not of top quality, and the mattress pads were not even the right size for the mattress I slept on. The mattress was too hard for me. Also, the rustic old patio furniture, which looks good in the photos, is really not usable or at all comfortable. It should be replaced with some functional outdoor furniture. The courtyard between these two cottages is really a nice space and was an area we enjoyed during the stay, but the landscaping certainly deserves some better care. 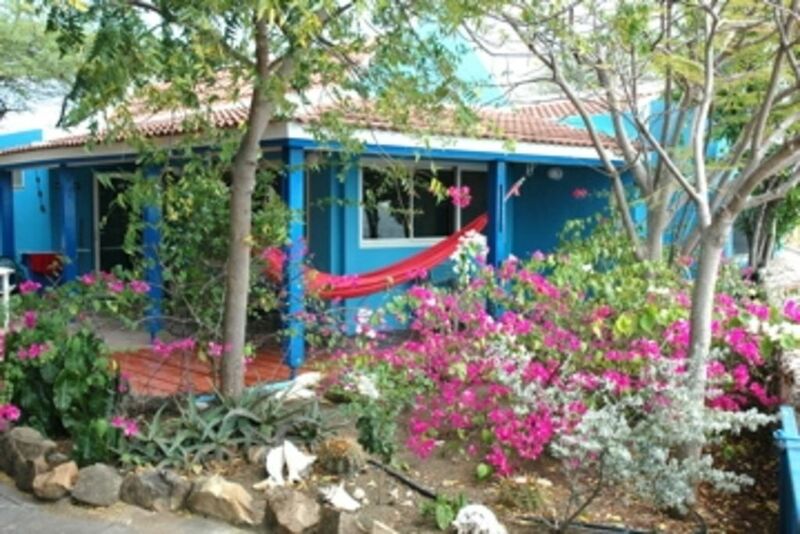 I see that the prices have gone down since I booked, so if you are two couples, or two adults looking for a place in Bonaire, this property may work for you. Nordende der Stadt am Boulevard. Weit genug, um ruhig zu sein, aber in der Nähe der Stadt. price is based on 2 persons, every extra person will be an extra $ 175 per week or $24 per day.- -At confirmation 20% of the rental amount within 7 days, otherwise the reservation is not assured. -The remaining 80% 21 days prior to check-in. -Cancellations more than 1 month prior to check-in will be charged at $ 65 -Cancellation is not possible within 1 month prior to check-in. -Governmental tax is beyond our control and subject to change without notice -Form of payment. A wire transfer or check. Additional units available, please inquire for details.